Shockingly few commercial landlords are really familiar with bullet proof barriers, even though there’s increasing demand for bullet proof windows among tenants common to suburban mixed-use retail centers. Family-owned pharmacies, precious metal buyers, and store-front financial service business that handle check-cashing, short-term loans, and money transfers all want bullet proof security. But just because there’s bullet proof glass, that doesn’t mean there are bound to be bullets flying. A finished bullet resistant barrier can be a complex “system” with dozens of fixed bullet resistant windows, DuPont™ Kevlar® fiber panels behind every wall, a large package passer, and several buzz-thru armor-plate doors. Or the barrier can be as simple as a single bullet proof window mounted over a ballistic cash tray. Whatever the barrier, it’s always going to include one or more sheets of “bullet proof glass.” This transparency isn’t just any old glass; in fact, it usually isn’t glass at all. Most modern bullet proof windows are made from one of several types of bullet-resistant thermoplastic, sometimes laminated in layers that can include traditional tempered glass. 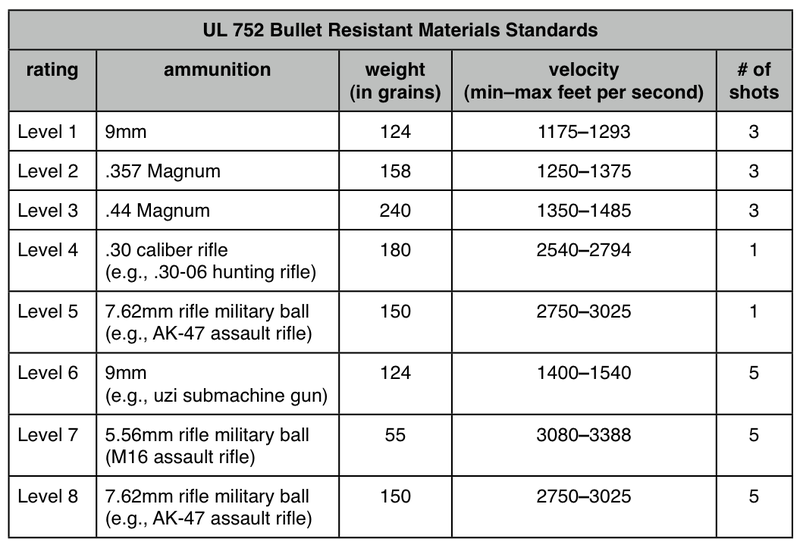 Regardless of material, every bullet proof window’s ballistic stopping power is rated along the same scale. The most important columns are the first, second, and final. Reading off the top row, we see that a bullet resistant window rated “Level 1” will stop three shots from a 9mm pistol. At the other end of the spectrum, Level 8 bullet resistant windows (the kind protecting exterior rooms of the White House) will stop a five-shot burst from an AK-47 assault rifle, similar bursts from an UZI or M16, a shot from a sniper rifle, blasts from a 12-gauge shotgun, and a whole lot of punishment from any pistol. For practical purposes, Level 4 through 8 bullet proof windows are also very often rated against forced-entry and even extreme weather events. As Jim noted, bullets are not the biggest threat to a tenant’s beautiful bullet proof window. It’s a far more common culprit that usually spoils a crystal-clear sheet of bullet proof glass: Windex. When bullet proof polycarbonate or acrylic are cut, drilled, or flame-polish, microscopic fractures form in the thermoplastic. These are not visible to the naked eye, and are structurally inconsequential. Windex and similar glass cleaners change the optical character of the edges of those fractures, making them highly visible, appearing to be tiny rainbow-tinted cracks deep in the glass. This is called crazing. It looks terrible, despite having no impact on the material’s bullet resistance. Surface scratches can be buffed out of polycarbonate or acrylic bullet proof windows, but crazing creates a haze that penetrates the surface and cannot be repaired. Gently dust with a soft lint-free cloth (e.g., an old t-shirt). Wash with a solution of warm water and mild soap or detergent, using a soft cloth or natural sponge. Keep the sponge sopping wet. Blot dry with clean soft cloth. Remove grease and oil using hexane, kerosene, or naphtha, not aromatic compounds like benzene. Surface scratches can be buffed out of acrylic by hand. Polish acrylic or polycarbonate with quality commercial wax. This fills minor scratches, restoring the original smooth surface. Never use paper towels on bullet proof glass! Never use scouring compounds or abrasive cloth! Partnering with an established bullet proof company like Total Security Solutions gives you an edge in addressing the needs of any potential tenant–especially when it comes to a highly-specialized niche need, like ballistic security. TSS’s expert staff can guide you through the bidding, measurement, installation, and maintenance of any ballistic system. Contact Total Security Solutions to learn more.